There is a special place that I have returned to whenever I have had the chance over the years. I don't know if you have had the experience of coming to a certain geographical location, and immediately being filled with a deep sense of peace and internal harmony. This place is like that for me. Moreover, it just feels right, as if I am meant to be here. I have a bond with the land. Each path, each vista, is a familiar friend, and welcomes me back although it might have been years since my last visit. The place I am writing about is Banff in the Canadian Rockies. More specifically, it is not just the town of Banff, or even the spectacular Banff National Park that has this effect on me. It is The Banff Centre, formerly called The Banff Centre for Fine Arts. The Banff Centre is located up on the side of Tunnel Mountain above the frenzy of tourists and hotels down below in the town. There are visual artists' studios, and musicians, and writing programs. Readings, dance performances, free jazz concerts, galleries, and lectures. And conferences of various sorts. Mostly, I have come here to attend conferences related to my profession and work. Every time I come here, I get a little glimpse of my lost self. That lost self, the creative me, is elusive. She imagines herself holed up in one of the little artist huts, painting. Or writing. Or just detaching from the greedy teeth and needy maw of work, and having the time and solitude to think and reflect. As I walk through the beauty of the quiet grounds surrounded by spectacular peaks and breathing in the scent of pine trees, she flits into view briefly bringing a surge of of hope and possibility. And then I am sitting in my next meeting or conference session, and she is gone again. My lost self. The self my busy dutiful life doesn't have time for. Most of the time, it is easy to forget that self in the busy whirl of daily tasks and obligations. But when I come here to The Banff Centre, I discover that she is still inside, wishing and hurting. I have just finished blocking in a new painting. I am working from a photo that I took one evening in the city of Lethbridge, Canada. Looking west beyond some buildings as the sun was setting, I saw the huge prairie sky studded with jelly bean shaped orange and apricot coloured clouds. In the foreground, dark buildings, parked cars, and trees were silhouetted against the colourful sky. Architectural features in the near foreground, such as wooden planters and a low retaining wall, created interesting shadows and reflected some of the orange glow. There also were patches of snow. 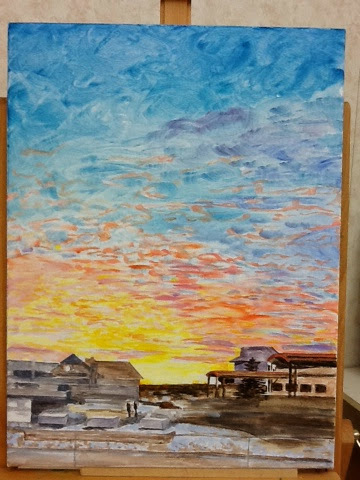 At this stage, I have blocked in the main areas of colour in the sky, as well as the dark buildings and foreground. Mostly, I have not started putting in the trees, except for a few dark marks placing some tree trunks relative to the other components of the scene. I will want to do more work on the sky first, and then paint the trees up into the sky. Although I am fairly happy with the shapes of the buildings, especially the one on the left hand side, I am really struggling to make the dark foreground dark enough. In my reference photo, everything but the sky is very dark, and even the bit of snow in the middle lower section is a mid-range value. This is a common problem for me. I tend to want to paint everything in high to mid values avoiding the dark tones, and in high key bright and light colours, avoiding shades of grey. But if the darks aren't dark enough, then the light and bright elements will not contrast enough to make them sparkle. So I have set myself the challenge of a night scene. I will keep working away at getting the darks darker. I am using raw umber, ultramarine blue, and paynes grey to make the dark values. When he was first learning to talk, one of my grandson's first sentences was, "Dig, dig, dig!" That is exactly what I have been doing this weekend -- dig, dig, digging. The statutory holiday Monday on the May long weekend always falls on or just before the 24th of May. We used to call the 24th of May "Victoria Day" in recognition of Queen Victoria's birthday. This long weekend, that for most people signals the functional beginning of summer, always poses a dilemma. Should we go camping, or should we stay home and garden? This year, as usual, gardening won out. I have lived in three Canadian provinces; on the coast, in the mountains, and on the prairies; in the northern and southern parts of the country; and in agricultural zones ranging from 2 to 7. Yet everywhere that I have lived, the local lore is that May long weekend is the time to put the garden in. 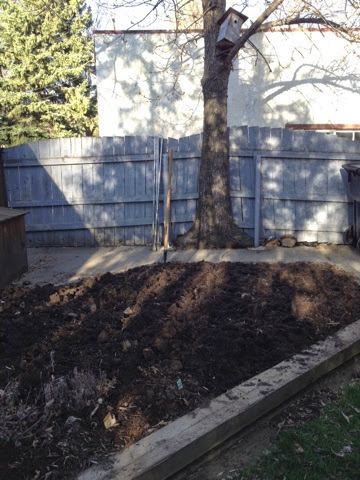 We have had a long cold spring, and until this weekend I had not even begun to clean out the garden beds. Also, when we moved in two years ago, I never really set up my gardening shed properly. So yesterday, I started off my gardening season by pulling all the old dead plants out of the vegetable garden (a task that I should have done last fall), and putting them in the compost. 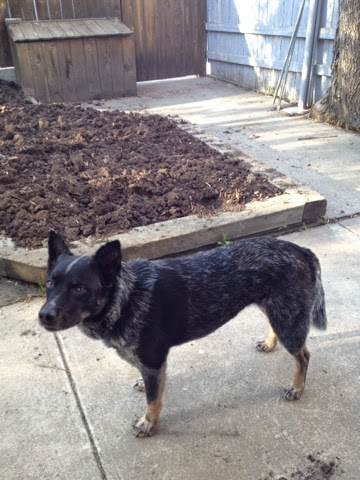 I threw down grass seed on all the dog-created bare patches in the back lawn. 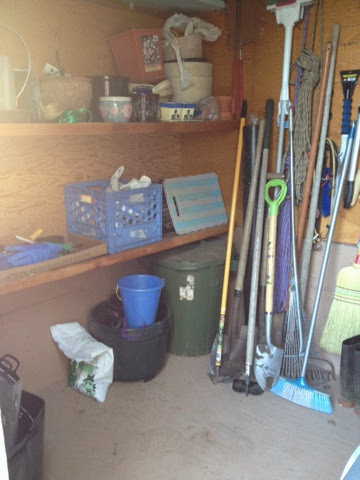 And then I cleaned and organized my gardening shed. I also started planning my garden. I went online and read up on organic gardening, growing potatoes, how to improve heavy clay soil, what type of raspberry canes do best in this area, shade tolerant vegetables, companion planting, and the recommended planting times for vegetables by seed or transplant in this climatic zone. Today, I went off to the garden centre and bought gypsum, worm castings, and organic fertilizer made of fish meal and ground seaweed. I need to add soil amendments because the natural soil is very heavy, dense clay, especially at the lower end of the garden, and most of the vegetables I attempted to grow last year did not thrive. Only the tomatoes, which I had augmented well with compost, and the herbs in a sunny corner did really well. Back from the garden centre, I started by pulling the few weeds out of the garden. Then I spread about 6 kg. of gypsum on the soil. Then I added four wheelbarrow loads of my homemade compost to the garden, spreading it on at a depth of about an inch. That used up my entire supply of compost. We have another pile that will be ready in three to four weeks, and a new pile that we have just started. Although we are dedicated composters, we just cannot make enough for all our gardens. Next I turned over the entire vegetable garden with the garden spade. This was the dig, dig, dig part. However, when my grandson said it, he did not mean shovelling garden soil. He was referring to his toys, a caterpillar and a front-end loader. It is heavy work turning over clay. However, I am pleased to report that there are lots of earthworms in the garden -- a good thing. By the time I finished, the shadows were getting long and my back was sore. It was very satisfying, though, because tomorrow I can start to PLANT! Digging and planting is always my favourite part of gardening. . . .well, along with picking, cooking, and eating the organic produce. Kate was my trusty helper. Actually, I think she was just waiting for me to come in the house and feed her some supper. 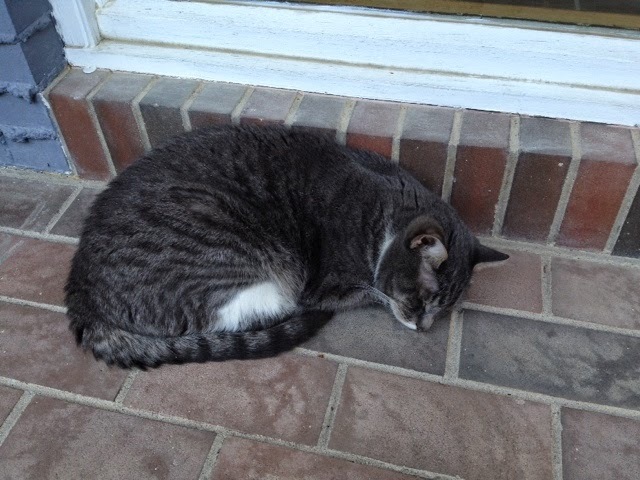 Oliver assisted by snoozing nearby on the sun-warmed brick. When I moved to the Canadian prairies from the west coast, one of the first things that I noticed was the paucity of fresh fruits and vegetables in the grocery stores. The selection is limited, the quality is low, and the prices are high. I find this frustrating and disappointing. Before I moved here, I had my own greenhouse, as well as a garden and fruit trees. I grew enough organic fruit and vegetables to supply most of our family's produce needs from June to October. But here in the farm belt of Canada, even in the middle of summer, grocery store choices consist of limp carrots and droopy lettuce imported from the USA or Mexico. Another thing missing from the grocery stores here is fish. When I visited my daughter on the west cost recently, I almost wept when I saw the fish counter where she shops. Great fresh slabs of halibut, wild salmon, snapper, and sole. There were live oysters, clams and mussels, and and huge local prawns. In my prairie grocery store, the "fresh" fish is actually previously frozen, and it is anything but fresh. When I buy fish, I choose it from the freezer, and there is minimal variety. I cannot say that I am very surprised by this, as I discovered years ago that many prairie people do not like fish. However, I made another disconcerting discovery in the grocery store a few months ago. We were having guests for dinner, and I had planned to serve roasted Cornish game hens, stuffed with rice and cranberries. Shopping for the dinner I planned to prepare, I could not find any Cornish hens in the poultry freezer, so I went in search of the meat manager. "We don't have any right now," he said. "I think I've got some coming in next week." Next week wouldn't be soon enough for my dinner that evening, so I stood in the store trying to rethink my menu. I decided to buy a large package of chicken breasts, and make a recipe that is one of my old favourites -- chicken with apples, onions, and sour cream, simmered in a casserole. And then I discovered that the store did not have fresh chicken breasts! Once again, I approached the meat manager. He pointed out a couple of packages of individually wrapped boneless, skinless, not very fresh looking chicken breasts. "But I want a family pack of split, bone-in chicken breasts," I said. "I have bought them here [in this chain store] for years!" "Oh, we don't carry those large packages anymore. They don't sell. People don't want them," he said. People don't buy chicken breasts?! I have have always thought of them as a basic, if somewhat mundane, cooking staple. The store didn't have any fresh whole chickens either. So, In the end, I had to change my dinner menu again. Since that experience, I have started to take note of what that grocery store actually does sell, given that it doesn't provide much of a fruit, vegetable, fish, or meat selection. In the meat section, there is a huge freezer that runs the length of the store. It is filled with frozen prepared foods, like egg rolls, teriyaki chicken wings, breaded fish sticks, corn dogs, pre-made frozen hamburger patties, and so on. There is another frozen food section that takes up an entire central aisle of the store. Frozen fruits and vegetables take up one small section, and the rest of it is devoted to TV dinners, frozen pizzas, perogies, frozen pies, and things like pizza pops. And, of course, there is a large section given over to ice cream. There is the junk food aisle with pop, chips, and candy. There is the cookie and cracker aisle, and a whole aisle just for packaged breakfast cereals. Yes, it is still possible to find rolled oats, and whole wheat flour, and raw almonds. But they are tucked in amongst the ever proliferating packaged and prepared foods and junk foods. I prefer to cook from scratch, using basic ingredients and adding my own sauces and flavourings. By cooking with fresh natural ingredients, I have more control over the salt, sugar, and fat components, and can avoid most of the preservatives and other chemical additives. Also, home cooking tastes better, and it is creatively satisfying to prepare interesting healthy meals. But real food seems to be disappearing from the grocery stores. The stores are huge, and the shelves are full of what appears to be endless variety at first glance. However, a closer inspection reveals that consumers mostly are being offered a choice between this prepared food or that prepared food, or yet another prepared food. To my mind, that is not real choice, and it is not what I would like to purchase or eat.